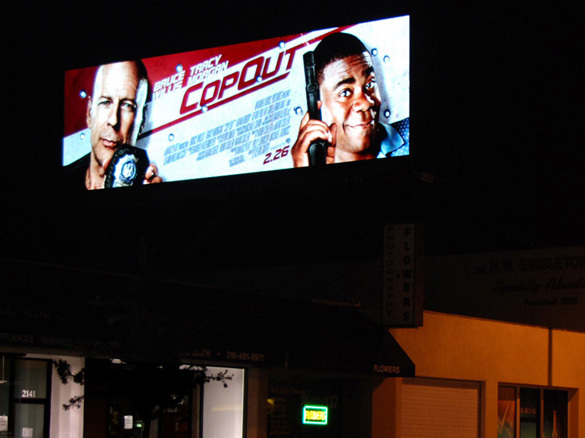 » Digital Billboards: Where are They Now? Where Would New Ones Go? Digital Billboards: Where are They Now? Where Would New Ones Go? During an L.A. City Council debate last fall, Councilman Richard Alarcon said that many residents and businesses in his east San Fernando Valley district wanted digital billboards and that he was tired of being “held hostage” by the the city’s more affluent Westside, where anti-digital billboard sentiment has run high ever since the first of the brightly-lit signs with their rapidly changing copy appeared without warning six years ago. All but two of the 101 digital billboards put up by Clear Channel and CBS Outdoor were turned off by court order in April, but lobbyists for the companies have been pushing for a deal with the city to allow all or most of them to be turned back on, in exchange for sharing some revenue and taking down some conventional billboards. Other companies have lobbied for a similar deal that would allow new digital billboards, which are currently prohibited outside sign districts. And one company, Lamar Advertising, has sued the city for the right to put up 45 new digital billboards at specific addresses on more than two dozen major thoroughfares. If these lobbying and legal efforts succeed, will Alarcon’s constituents get their wish, digital billboards beaming their flashy ads every eight seconds on commercial streets in Pacoima, Panorama City, Sylmar, and other communities in that council district? Right now there isn’t a single digital billboard in any community in Alarcon’s district. In fact, there are no digital billboards in nine of the city’s 15 council districts. The distribution of billboards converted to digital through a much-reviled and later-deemed-illegal lawsuit settlement with the city looks like this: District 5: 49 District 11: 26 District 10: 12 District 4: 9 District 13: 3 District 2: 2 It hardly requires a Ph.D in economics to figure out why 75 of the 101 digital billboards ended up in two council districts that encompass communities like Westwood, Brentwood, West L.A. and Venice, where residents are among the city’s most affluent. Add to the equation the cost of converting to digital screens, which often requires structural and electrical upgrades, and one can see why Clear Channel and CBS Outdoor saw a better return on their investment on the city’s westside as opposed, to say, South L.A. or the east San Fernando Valley. But other billboard companies have been eyeing a piece of the valuable digital billboard pie, and if their lobbying efforts are successful and the City Council changes its laws, won’t new ones be likely to go up in those council districts that were shunned by the two billboard giants? Alarcon is leaving the council next week, but will he have the satisfaction of knowing that digital billboards will likely appear in his old stomping grounds? If the Lamar Advertising lawsuit is any guide, probably not. Of the 45 locations the company has proposed for brand-new digital billboards, not a single one is is Alarcon’s district. In fact, 34 of the 45 addresses are in the six council districts that are now home to the digital billboards owned by Clear Channel and CBS Outdoor. Three council districts have none, and another three have only one. In the always passionate and sometimes acrimonious debates about digital billboards, some city council members and others have said that only communities that want the signs should have them. But if the billboard companies prevail in city hall and the courts, it looks like more of the same, digital billboards concentrated in the very council districts with the most vocal opposition. After last fall’s council debate in which Alarcon aired his “held hostage” complaint, the body voted 11-3 to proceed with drafting agreements with the billboard companies to legalize digital billboards in exchange for revenue sharing and community benefits. Unsurprisingly, two of the no votes were cast by Paul Koretz and Tom LaBonge, councilmen with a significant number of digital billboards in their districts. (Councilman Bill Rosendahl, whose district has the second-highest number of the billboards, was absent but sent a letter expressing his opposition. The other no vote came from Mayor-elect Eric Garcetti.) Shortly after that vote, the California Appeals Court upheld a Superior court decision invalidating the backroom lawsuit settlement that would have allowed Clear Channel and CBS Outdoor to convert a total of 840 conventional billboards to digital. The court also directed the Superior Court judge to revoke the permits issued for the 101 billboards converted before the City Council passed a moratorium on the conversions at the end of 2008. The judge eventually issued a “pull the plug” order, and the billboards have been dark now for more than two months. And the City Council directive to draw up agreements legalizing the signs appears to have quietly died in the face of public outcry, although lobbying efforts for just such a deal continue in the nooks and crannies of City Hall and nobody with a sense of the way city business is conducted would be foolish enough to predict that it won’t be revived.